The International Avalanche Risk Scale is an important tool in off-piste decision making, but it is frequently misunderstood. If you have ever said, “It’s only three out of five, it’ll be fine,” you need to read this right now. I am not going to say that you should never venture off-piste on a cat. 3 day, but you need to be aware of the risks when you do. Category 3 does not mean ‘moderately safe’ as a lot of skiers seem to think. Most good skiers and snowboarders I meet think they understand the avalanche scale because they think they understand a scale of 1 to 5. Category 1 is obviously as safe as it gets and category 5 must be really dangerous. So far so good. The next assumption is that category 2 is fairly safe and category 4 is pretty dangerous. Not exactly, but close enough. And the last assumption is that category 3 is middling, moderate or average. Not too dangerous anyway. And this is where people get into trouble. English speaking countries are promoting the wordy version of the scale, rather than the numbers. In this version, the five categories are low, moderate, considerable, high and very high. Would you say, “It’s only considerable risk today,” with the same nonchalance as you might say “it’s only three out of five”? The other takeaway from the wordy version is that category 2 is ‘moderate’, not ‘fairly safe’. Unfortunately, the need to cater for speakers of different languages means that European countries are unlikely to abandon the numerical scale in the near future. Almost every time I read about an avalanche accident there will be a sentence somewhere saying the avalanche risk was ‘considerable’. 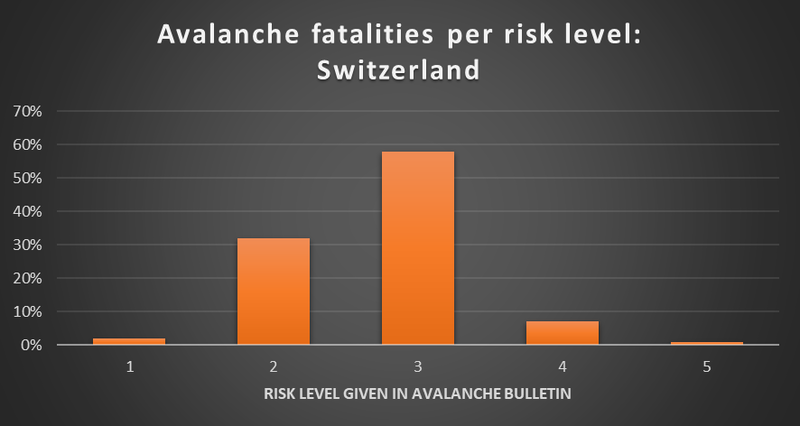 My own impression from reading newspaper or online reports is that the vast majority of all fatal avalanche accidents happen when the risk is category three. Let’s have a look at whether the statistics agree. From 2001 to 2011, l’ANENA compiled statistics on 238 fatal avalanches in which 317 people died. Looking at the 207 avalanches which occurred in the winter months (when the avalanche bulletin was published), gives the following graph. Backcountry refers to ski tourers, walkers and snowshoers. Off-piste refers to skiers and snowboarders in lift-accessed terrain. 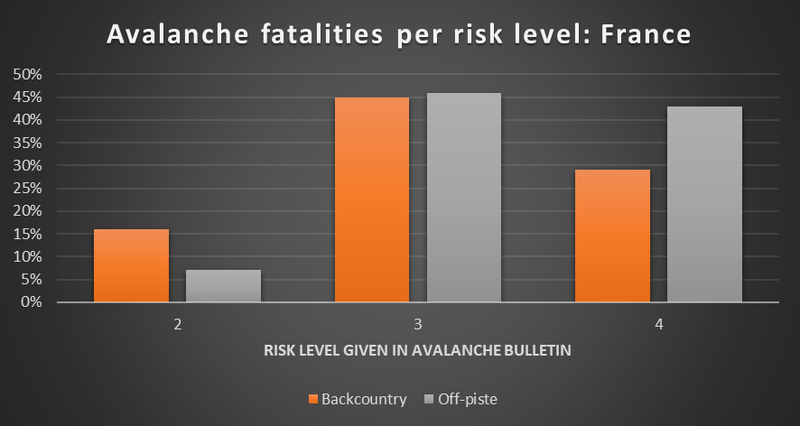 SLF have compiled statistics of the number of ‘avalanche victims per danger level for persons caught while engaging in backcountry or off-piste activities, or in buildings or on transportation routes (accidents between 1997/98 and 2015/16’. Bruce Tremper’s excellent book, Staying Alive in Avalanche Terrain gives some statistics for avalanche accidents in the United States and Canada. While the graphs above differ considerably at hazard levels of two and four, they all show clearly that category 3, or ‘considerable’, is the most dangerous level in all four countries in terms of the number of fatalities. There are many different wordings of the International Avalanche Hazard Scale in use, but all of them give a similar interpretation. The table below is from Wikipedia. 1 – Low Snow is generally very stable. Avalanches are unlikely except when heavy loads are applied on a very few extreme steep slopes. Any spontaneous avalanches will be minor sloughs. In general, safe conditions. 2 – Moderate On some steep slopes the snow is only moderately stable. Elsewhere it is very stable. Avalanches may be triggered when heavy loads are applied, especially on a few generally identified steep slopes. Large spontaneous avalanches are not expected. 3 – Considerable On many steep slopes the snow is only moderately or weakly stable. Avalanches may be triggered on many slopes even if only light loads are applied. On some slopes, medium or even fairly large spontaneous avalanches may occur. 4 – High On most steep slopes the snow is not very stable. Avalanches are likely to be triggered on many slopes even if only light loads are applied. In some places, many medium or sometimes large spontaneous avalanches are likely. 5 – Very High The snow is generally unstable. Even on gentle slopes, many large spontaneous avalanches are likely to occur. If we look at the second column we can see that the stability ranges from very stable snow to generally unstable snow, as we would expect. Now let’s re-read the description for 3 – Considerable. ‘On many steep slopes the snow is only moderate or weakly stable.’ In other words, there are many slopes where the snow is weakly or moderately bonded. Reading along we see that ‘Avalanches may be triggered on many slopes even if only light loads are applied.’ A light load means a single skier, snowboarder or walker. To put it another way, there are many slopes where the weight of a single skier can trigger an avalanche. In order to ski safely off-piste when the risk is considerable, you need the knowledge to avoid the ‘many’ steep slopes which are dangerous. Or you need to avoid altogether those slopes which are steep enough to avalanche. Why do so many people get caught in avalanches when the risk is ‘considerable’? With both the statistics and the wording of the avalanche forecast telling us that category 3 is dangerous, why do so many people get caught in avalanches on those days? Perhaps more tellingly, why do so many expert skiers, snowboarders and mountaineers get caught on those days? There are many factors to consider here. Moderate risk could be considered as green light conditions, where most routes are practicable. High risk indicates red light conditions where most routes are dangerous. Everybody knows they have to be careful when the risk is high. Considerable risk means amber light conditions – dangerous but not so dangerous that all off-piste routes should be avoided. In any situation, the borderline conditions are the hardest to judge. Many users of the mountain environment tend to overestimate their avalanche skills. This can be especially true of those who consider themselves experts at their sport. All too often their avalanche skills do not match their skiing or snowboarding ability. 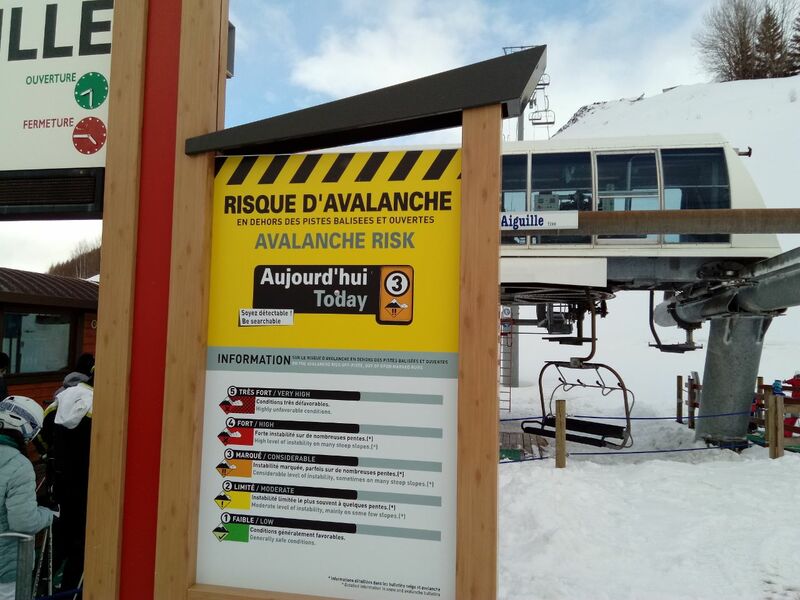 People either misinterpret the avalanche scale as discussed above, or they understand what considerable risk means but overestimate their ability to travel safely in avalanche conditions. A bad decision in avalanche terrain will often have no adverse consequences. People will get away with it most of the time. Bad decision-making is reinforced until the day an accident happens. Additionally, the set of human factors known as ‘heuristic traps’ tend to lead people to make bad decisions. A proper discussion of these will need a post of its own, but here are some examples of how they might influence people’s behaviour on a considerable risk day. The ‘scarcity’ trap leads people to ignore danger signs in the rush for fresh tracks on a powder day. The ‘acceptance’ trap can make them avoid voicing concerns in front of the group. The ‘expert halo’ trap abdicates the decision-making to somebody else. Finally, the ‘commitment’ trap ignores evidence that might interfere with completing the day’s objective. Just knowing that category 3 is statistically the most dangerous level will not necessarily keep you safe. But at least you will not be ingorant of the risks. Read the avalanche bulletins, choose appropriate terrain, and above all, stay safe out there.